UltiGuard UltiCare Short Pen Needles (31g, 8mm, 100ct) are non-pyrogenic and non-toxic. They may be used as replacement needles for all Type A pen delivery devices including: Autopen, BD pen, FlexPen, Humalog Pen, Humulin Pen, InDuo, InnoLet, Innovo, NovoPen Junior, NovoPen, Byetta, Forteo Pen, Lantus, SymlinPen, and Humapen 3ml. 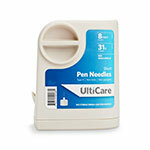 UltiGuard UltiCare Short Pen Needles is a complete solution for the dispense/disposal of your needles. 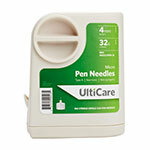 The Ulti Guard conatiner stores the pen needles convenience and immediate delivery. To dispose of a needle, just place it on the top of the container and give it an easy turn. 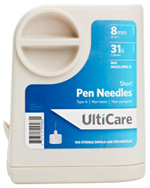 The needle will be safely discarded inside of the container, greatly reducing the risk of accidental needle sticks. 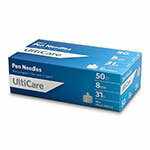 My husband and I are both insulin dependent diabetics, we buy these needles and they are wonderful. 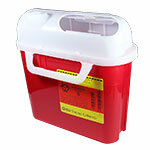 The container is its own sharps box and it is so easy to use. The needles slide in really smoothly (and that's important). I will continue to use these needles. You also cannot beat the price!